By Craig | February 12, 2019 | This post may contain affiliate links, which means we may receive a small commission, at no cost to you, if you make a purchase through a link. Read our Disclosure. 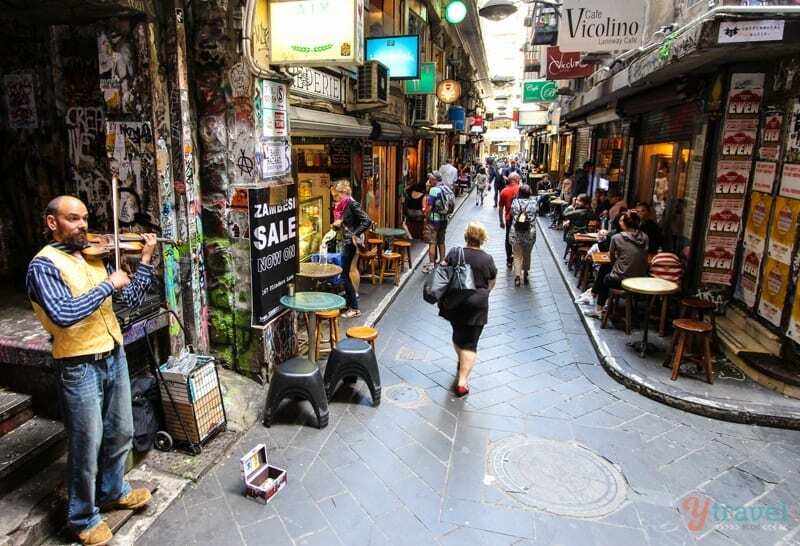 You’ve probably already seen photos of Hosier Lane in Melbourne? 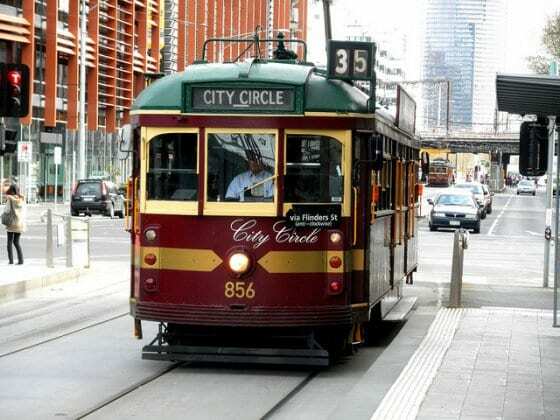 It’s easily recognizable from many tourism photo campaigns and one of the most popular things to do in Melbourne. 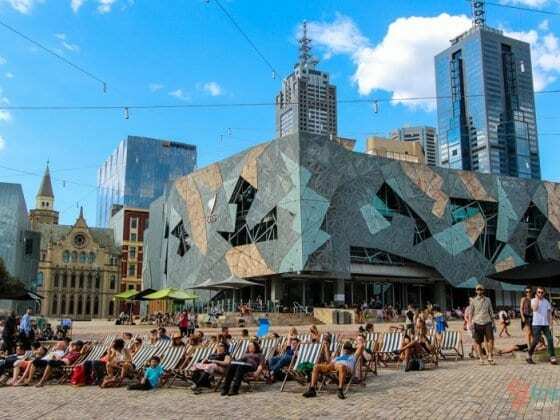 During our 8 day visit to Melbourne, we discovered a lot of cool things to do in Melbourne, from the obvious to the not so obvious, and a lot of it was due to you guys for all your insider tips and recommendations for a visit to Melbourne. 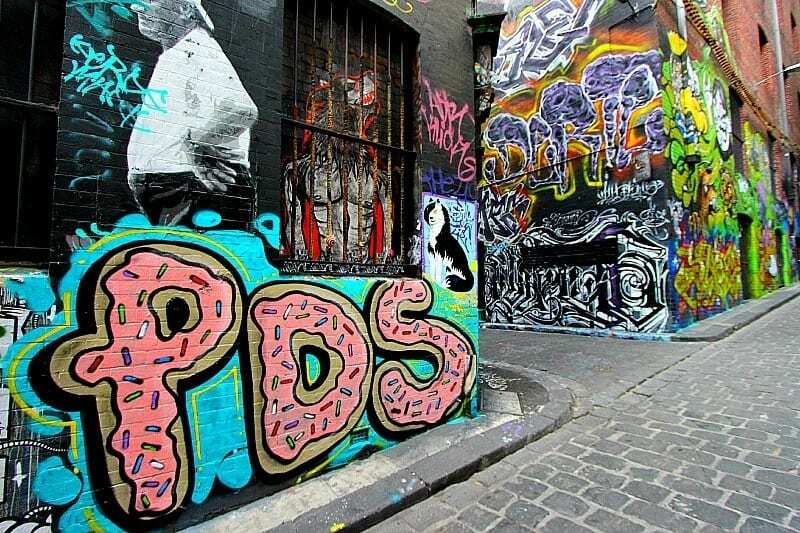 We already knew Melbourne was referred to as Australia’s cultural capital and has a reputation for many things – to die for coffee, heavenly food, boutique shopping, festivals, sports, music, and erratic weather – but it’s also famous for its street art. 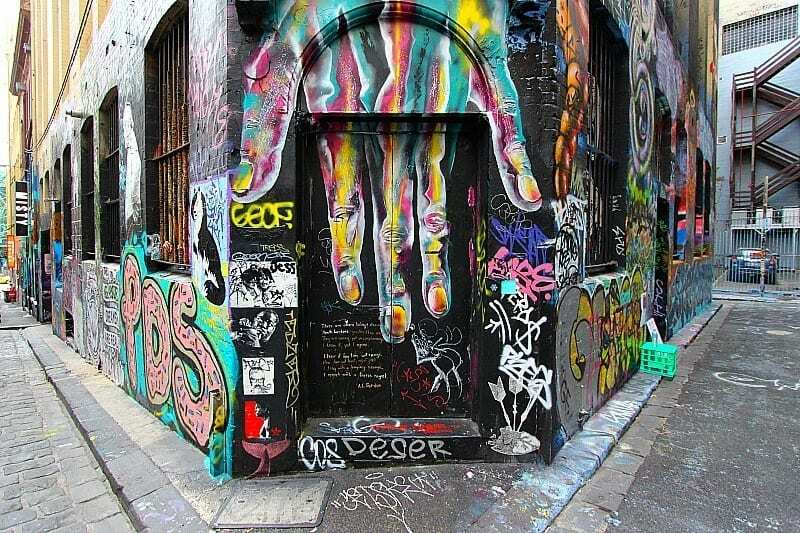 Hosier Lane is a pedestrian and vehicle lane way and the much celebrated landmark due to its sophisticated urban art (graffiti lined walls). 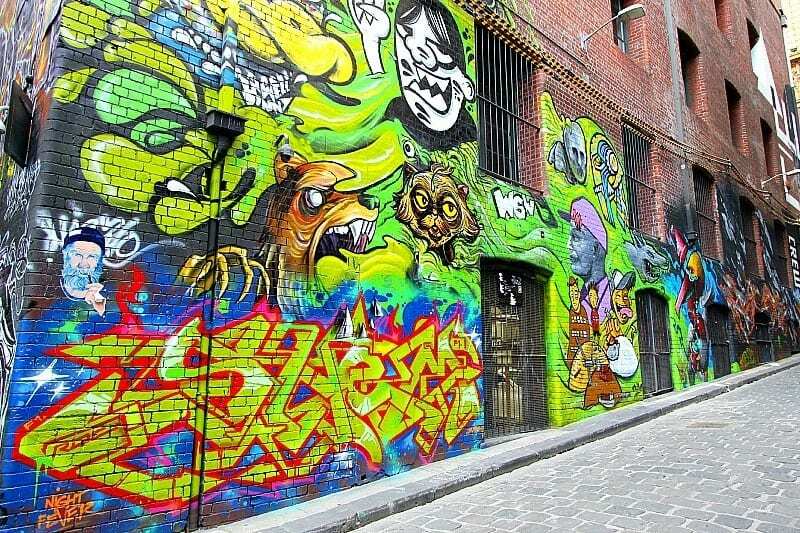 We got to know Melbourne’s graffiti scene simply by walking around on our own. 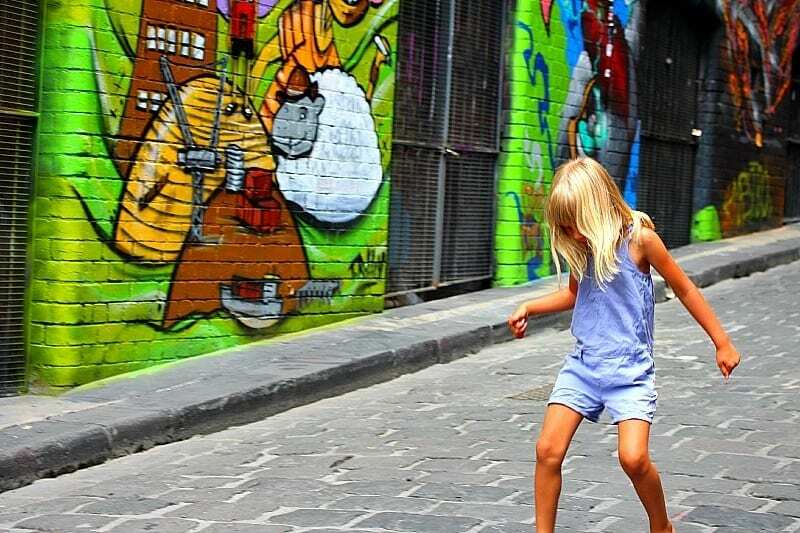 You can do specialized tours who take you to all the historic laneways and arcades and it would have been nice to know a bit more about the artists and history, but with the kids in tow we decided to just wander by ourselves. Typically we were looking for good cafes to have coffee like in Centre Place in the CBD or over in Fitzroy. You can also witness many examples of street art by riding the free city circle tram and jumping off at points that interest you. 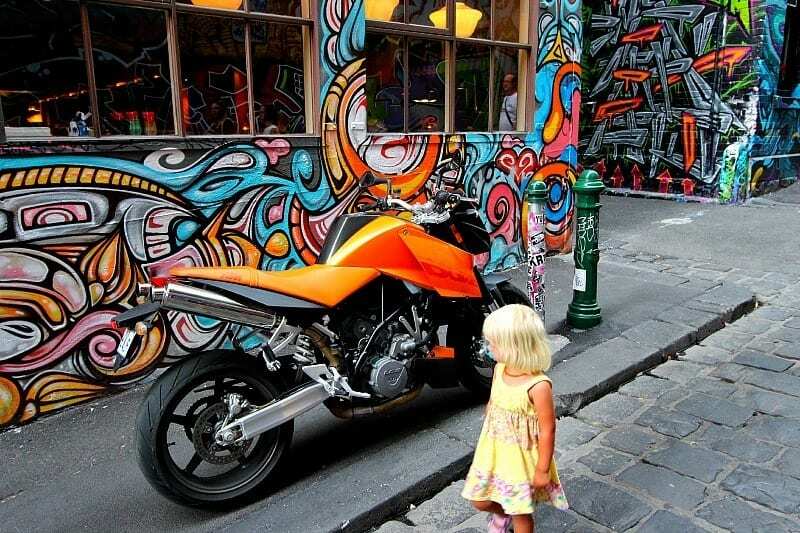 Hosier Lane is easy to find and easy to get to. It’s a 2 minute walk from Flinders Street Station and Federation Square, and runs between Flinders St and Collins St.
Local and international artists use the walls as a temporary canvas for their works, and even without knowing the stories behind the paintings or the artists, the art is very interesting to look at. 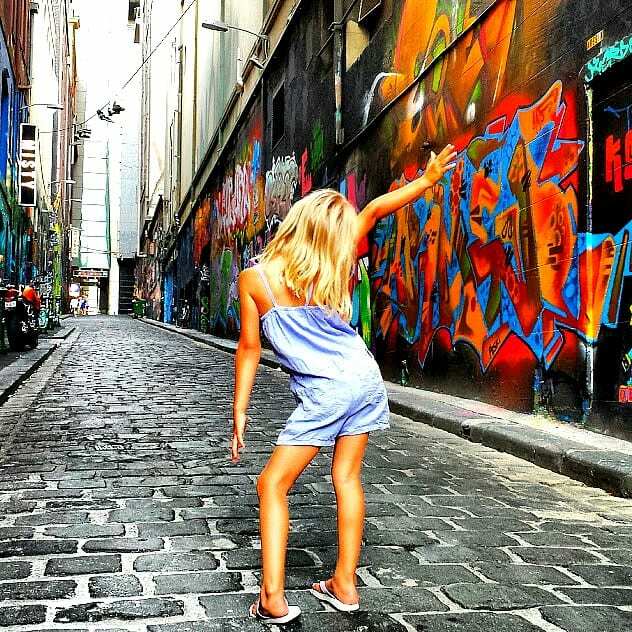 The kids enjoyed themselves and were kept occupied by the colourful designs, particularly Kalyra who also found the lane way to be a great backdrop for posing and busted out some dance moves J-Lo would be proud of. 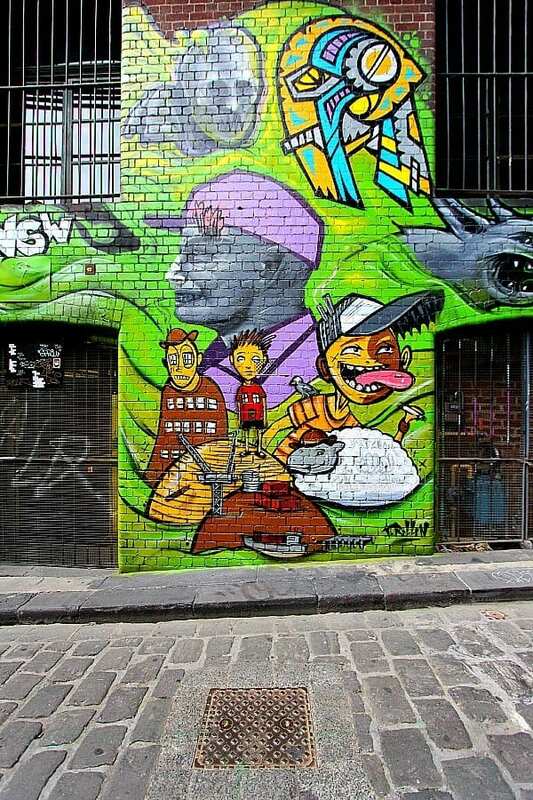 Oh, and if you’re looking for a good place to have coffee AND see some street art, go check out Centre Place which is also an easy walk from Flinders Street Station. This is what it looks like. 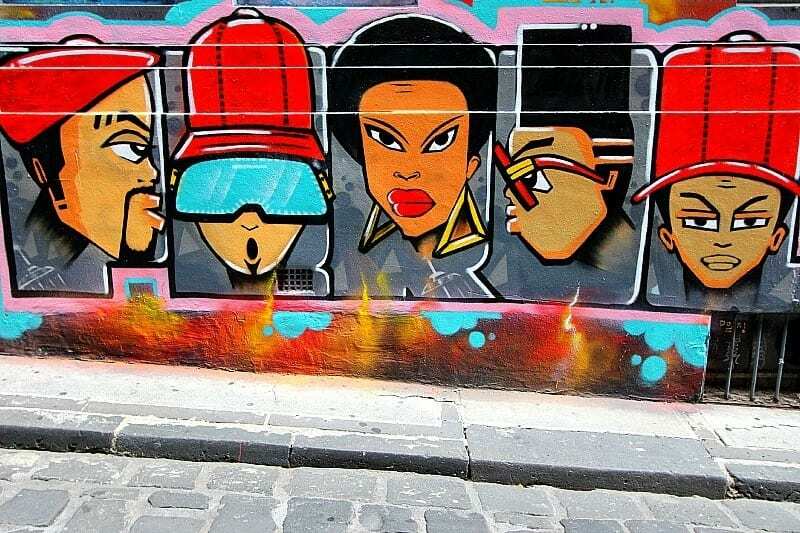 Melbourne’s laneways and side streets are rife with street art, some better quality than others. 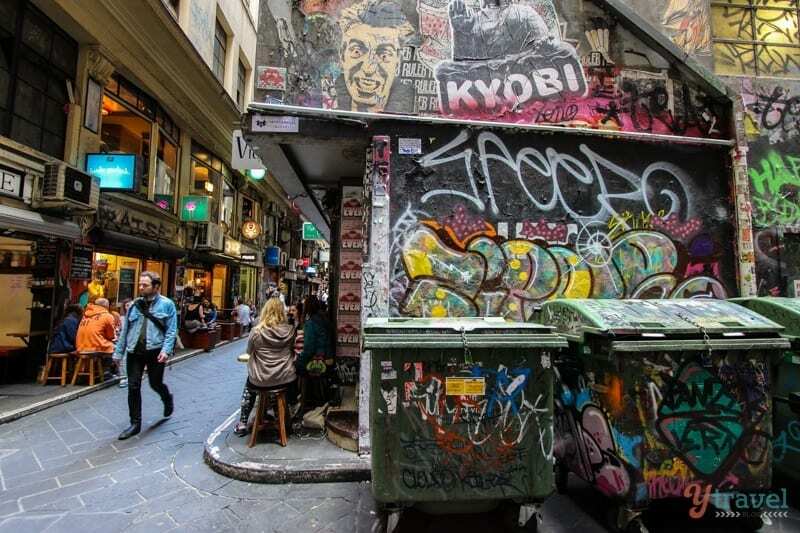 But if you don’t have time to do a dedicated tour and only want to take a glimpse, and for free, don’t miss Hosier Lane as an iconic thing to do in Melbourne. Booking.com has over 2000 properties in Melbourne. You get free cancellation on most rooms and a best price guarantee. 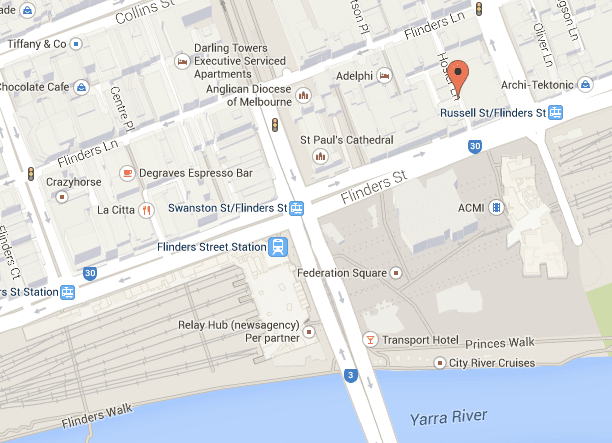 Check out these awesome tours of Melbourne with our partner Viator. 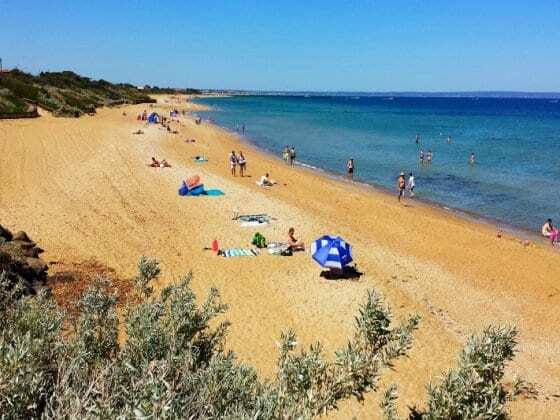 You can read more tips on things to do in Melbourne by clicking here. Awesome! Definitely a spot I would want to check out in Melbourne! Yeah, it’s impressive that’s for sure! 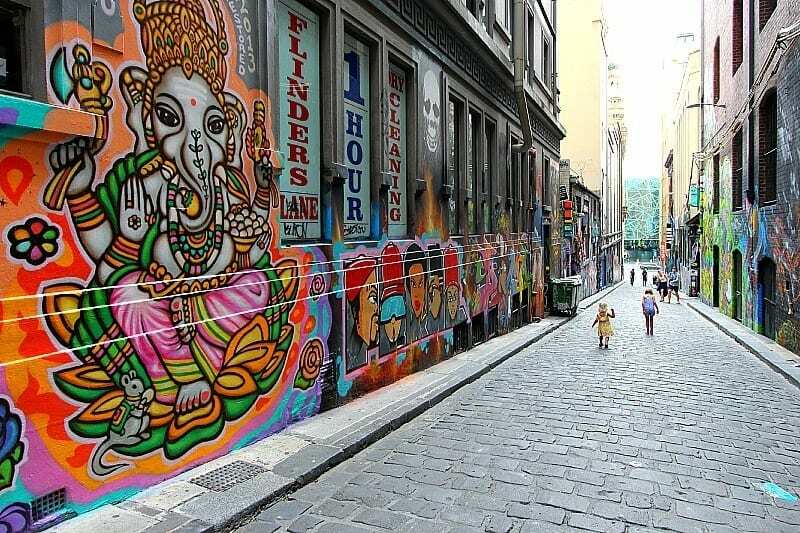 Hosier lane is great – the Ganesh is still my favourite – I did a post on Melbourne street art a few months ago – we have amazing works. 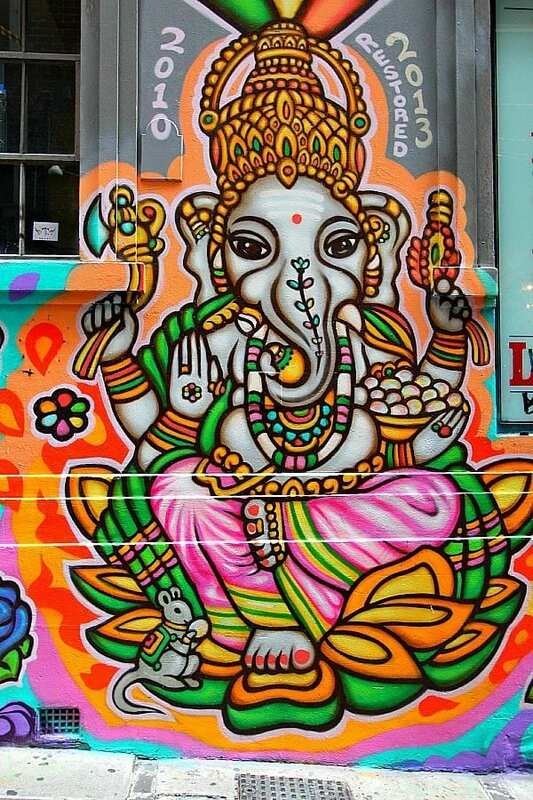 Ganesh is the Hindu god who looks like an elephant. This is really cool! 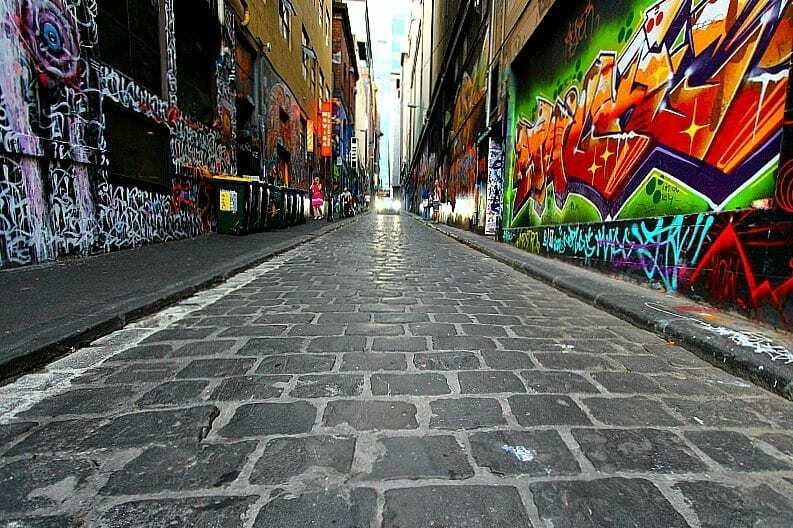 I have been to Melbourne a few times and are ashamed to say I have never seen this lane or heard of it before now. Heading there later in the year so thanks to you guys I will be checking it out! Surprised you haven’t heard of it before Jen. Glad I’ve brought it to your attention! Definitely check it out. 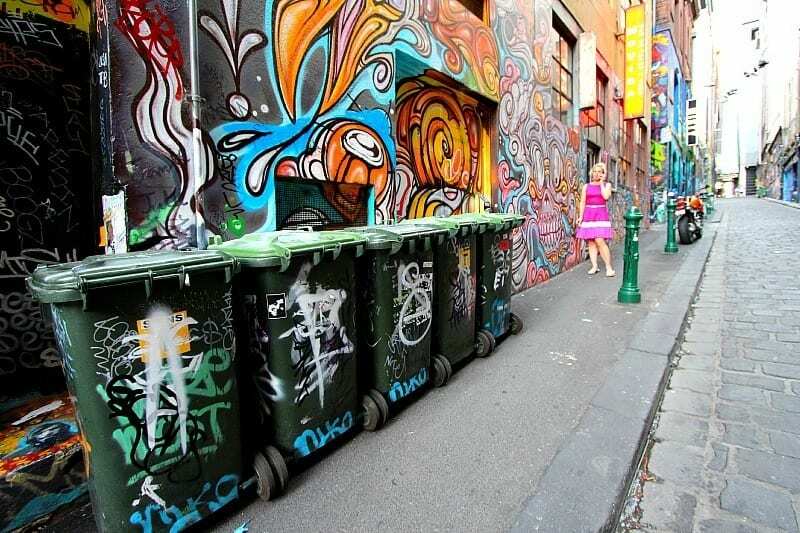 Ah this brings back memories of when I wrote about street art in Melbourne, in particular Hosier Lane. The art has certainly changed a lot in a year. I understand it can change every few weeks hence one of those spots you have to keep revisiting. I first came across it on those I’m Free Tours but like you say it is easy to find. I often stop off for a drink and snack on those side streets. Yeah not sure how often art work changes. I did see those “I’m Free Tour” guys taking people around but never managed to jump on one. Next time for sure! Great photos! The colours, and your little ones dancing around in front of the wall canvasses, are awesome! 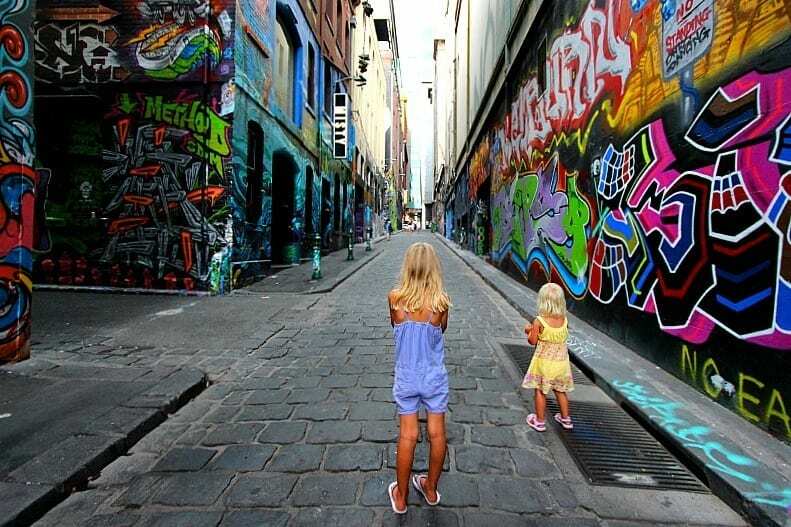 I love the ever-changing view down laneways like Hosier Lane. A couple of other recommended spots for street art hunting is Union Lane off Bourke Street Mall, and down Croft Lane in Chinatown. 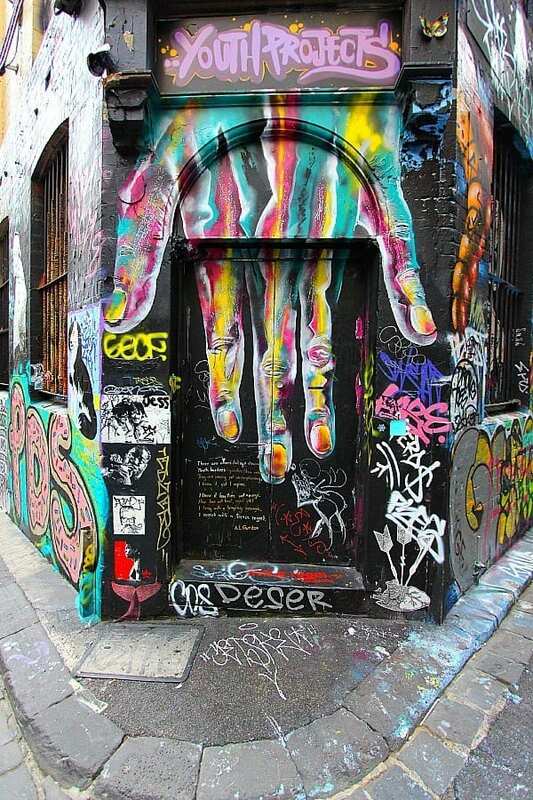 Hosier Lane looks awesome!! Definitely one to remember for when I go to Melbourne later this year, so thanks for posting. You bet. Don’t miss it Bonny! We went late in the afternoon and there were probably only 5 other people. Good timing I guess. 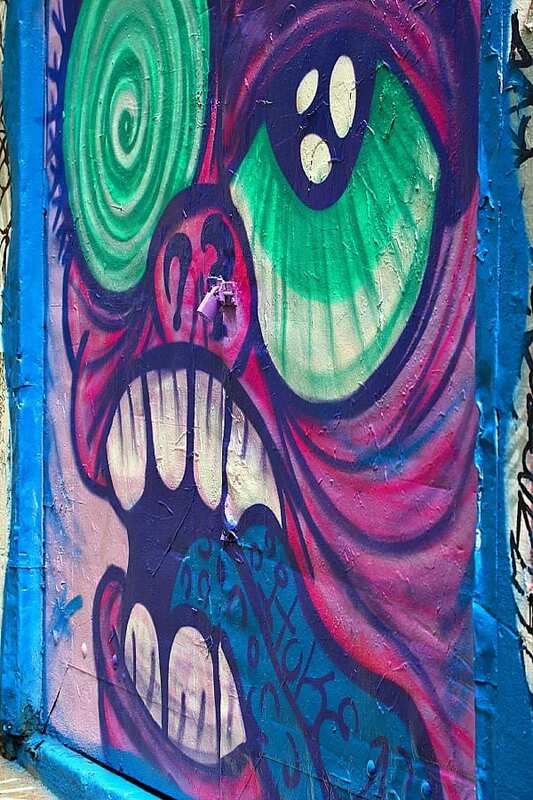 I am such a big fan of Street Art and this is definitely somewhere I will check out if I am in that neck of the woods. It’s so encouraging that these places are allowed to flourish by the local authorities and that the local community supports this creativity. I agree Lisa. Done tastefully it ads an edge to the city. I am obsessed with Street Art & love searching for it while I am traveling. This is definitely a place I want to visit when I am in Melbourne. Just one of the great reasons to visit Melbourne Jaime. Come on down. And they say Berlin has the best street graffiti… certainly NOT :)! Ok, this definetly goes in to my to do list when i visit Melbourne. Hosier lane is one of my favourite places to go in Melbourne.I always make sure I return there each visit to see the changes in the art. it’s amazing how quickly some of them disappear. Not so long ago they painted most pieces out and started again. Thankfully they kept Ganesh, one of my favourite pieces! We’ll have to go back and compare next time too. Seems like Ganesh is the winner from all the comments. I have put these in my “to visit list” for that long weekend to Melbourne my partner keeps promising. Great photos, the colours certainly pack a punch!! 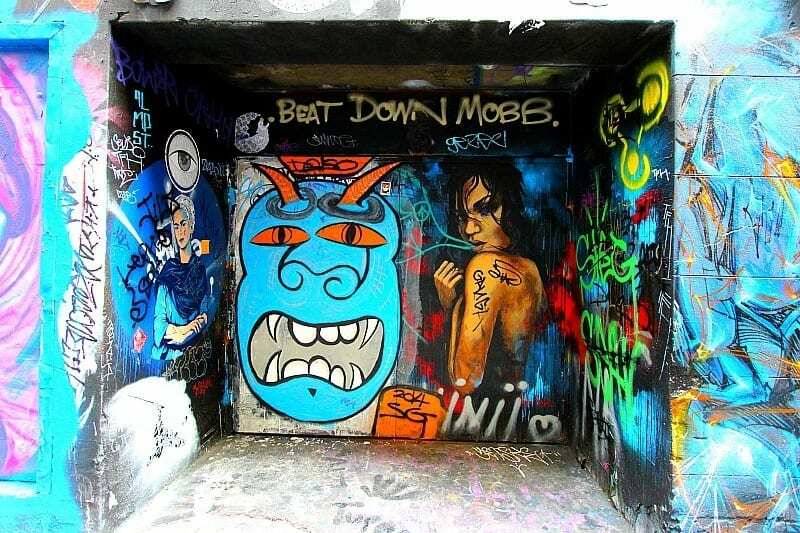 I love Hosier Lane. So bright and colourful. And always ever changing. Was there yesterday. I love how the lane changes from one week to the next.